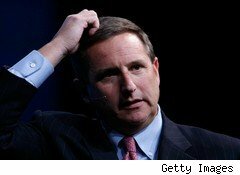 Was Mark Hurd Really That Good for Hewlett-Packard? Mark Hurd's departure from Hewlett-Packard (HPQ) leaves many gossipy questions unanswered. But a look at its financial statements during his tenure as CEO, which began on April Fool's day 2005, raises even more issues about how effective a CEO Hurd really was. While the stock price doubled under his leadership -- from $21 to below $42 -- and his departure sliced off 10% of its value, there seems to be a gap between HP's net income growth and the slide in its cash position while Hurd manned the helm. The latest twists in the story behind Hurd's departure have gotten even stranger. Jodie Fisher, the outside contractor who originally alleged sexual harassment, now says she's "surprised and saddened" by his quick ouster. She may or may not have any qualifications for a job as a marketing consultant. Fisher appeared in some R-rated movies -- such as Sheer Passion and Intimate Obsession -- and had a stint as a failed reality-show contestant, according to The New York Times. Both Fisher's lawyer, Gloria Allred, and Hurd claim there was no sexual relationship -- but the phrasing sounds Clintonian to me. Why would Hurd file false expense reports to hide payments to Fisher of between $1,000 and $20,000, according to the Times, if everything was perfectly above-board? We also know Hurd took pains to interview her personally in 2007 for whatever it was she was doing for HP. But the real question at hand involves Hurd's performance as CEO. A look at HP's financial statements under him suggests that a doubling of HP's stock price isn't really warranted by the change in HP's financial results during his tenure. In the last five years, HP revenues have grown at a 7.5% compound average rate, while its net income has grown at a more impressive 17% annual rate over five years, from $2.4 billion to $8.5 billion. HP's net margin during that period grew from 2.8% to 7.1%. This all sounds great, but two things about these numbers are questionable. The first is that during this period, HP's cash position hasn't kept up. Its cash and short-term investments slipped from $13.9 billion to $13.3 billion. During the same period, HP's long-term debt skyrocketed from $3.4 billion to $14 billion. The second concern is that HP's profitability was weaker than the industry under Hurd. HP's five-year average net profit margin of 6.2% was substantially below the diversified computer systems industry average of 9.4%. And HP's five-year average return on equity was 16.6%, a bit more than half the 30.9% industry average. Interestingly, Hurd's reputation as an efficiency expert isn't really borne out by these numbers or by a basic productivity statistic -- income per employee. Here, HP underperformed the industry by 15.2% -- generating income per employee of $28,069, compared to $32,331 for the industry. What do we really know about Hurd's reign at HP? We know the stock price doubled and that net income was up tremendously. We know Hurd made many acquisitions, including EDS, 3Com and Palm. But he nearly quadrupled HP's debt load while cutting its cash. We also know that he left HP with about $28 million in severance pay, but we really don't know why -- yet. Sunday's revelation about the identity of the marketing consultant on whose behalf Hurd faked expense accounts raises more questions about what really happened here. And a look at HP's financial statements raises other questions about whether a doubling in HP's stock price while Hurd ran HP was really justified.